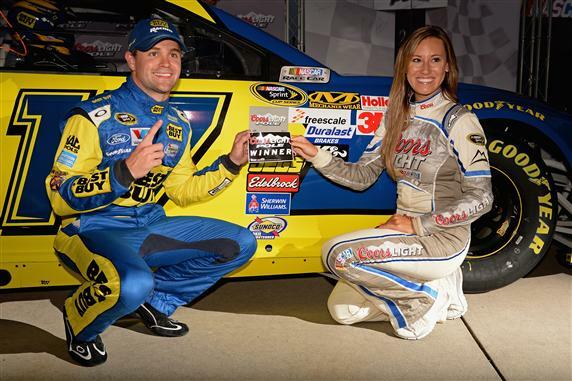 While his girlfriend, Danica Patrick, has overshadowed him for most of the 2013 NASCAR Sprint Cup season, on Friday afternoon it was time for Ricky Stenhouse, Jr. to show the NASCAR world who wears the pants in the relationship. Ricky Stenhouse, Jr. captured his first Coors Light Pole Award at Atlanta Motor Speedway Friday afternoon after deciding he needed to listen to his car owner, Jack Roush, and run the bottom of the line.Stenhouse’s lap was 189.688 mph on the 1.54 tri-oval just outside of Atlanta, Georgia. Juan Pablo Montoya (188.539) and Denny Hamlin (188.533) earned spots on the second row. The rest of the top 10 was Jeff Gordon, Matt Kenseth, Martin Truex Jr., Dale Earnhardt Jr., Kyle Busch and Jimmie Johnson. No one was sent home with 43 cars entering the race, while Brian Vickers, who qualified 22nd, will go to the rear of the field due to an engine change.